Buying a house requires quite a bit of forethought: you consider your past, present, and future when buying a house. After all, that house will become your home. You invest financially, emotionally, and physically into the transformation from house to home. But what happens when a natural disaster, or other unforeseen occurrence like a fire, destroys your home? 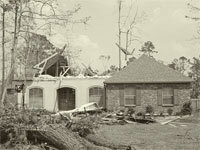 The people of Louisiana only know too well what happens to a loving home when a hurricane hits. Hurricane Katrina devastated Louisiana, leaving behind a trail of broken families and homes. Worse, homeowners who were trying to return their lives to some semblance of order faced problems in their homeowners insurance claims. Litigation in these kinds of situations is long-winded, confusing, and often difficult to follow. A main problem in proceeding forward with such litigation is the lack of documentation and evidence the homeowners possess. While insurance companies have a reputation of being litigious and difficult, they are merely trying to protect their best interests against false claims—a logical thought, but one that must be remembered despite a highly emotional situation that a homeowner undergoes during litigation. At the same time however, homeowners need not be shortchanged if they choose to file an insurance claim. While homeowners generally file insurance claims in stressful situations—natural disasters, fires—they should try to document their insurance claim journey. There are a few tips to help homeowners during such a difficult time: maintaining summaries of conversations and noting down the time are important. Another tip is to take pictures of the damage, and also the repairs in progress, if there are any. Finally, once an attorney has been hired, it is best to avoid communication with the insurance company. Sometimes, homeowners may accidentally disclose litigation strategies or crucial pieces of evidence; as such, it is best to avoid talking to insurance representatives. However, you should not rule out the possibility of reaching a fair settlement from the insurance company. Typically once a lawsuit has been filed and attorney involved, that is an incentive for insurance companies to move towards a fairer settlement for the homeowner. The involvement of an attorney makes it more likely for an insurance company to consider the best interests of the homeowner, especially considering in lieu of a future trial. "We were very satisfied with the swift and expert handling of our home owner's claim. Thank you for the generous and fair settlement you were able to negotiate on our behalf. Without your help we would not have been able to complete the repair to our home." Such satisfied clientele attest to the fact that the Berniard Law Firm’s team is dedicated to seeking success on behalf of its clients. Contacting Berniard’s top-notch litigation team is the right action to take if you are wrestling with a difficult, time-consuming homeowners insurance claim after a devastating occurrence. Has your claim been Denied, Delayed or Underpaid? Let the Berniard Law Firms team of experts help you recover under all lines of coverage. Contact the Berniard Law Firm today and they will immediately begin working on your case.